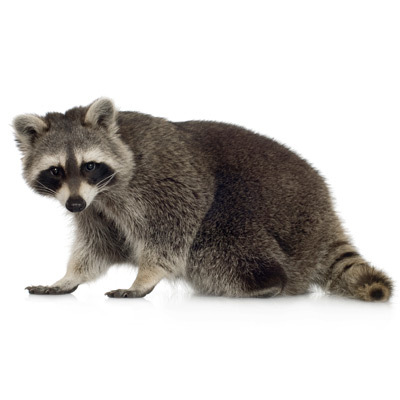 Raccoon control and nuisance animals found in Massachusetts, New Hampshire and Southern Maine. Raccoon’s are very talented animals. They are well-adapted to live in almost any setting as long as there is ample food and water sources. This can include urban and suburban areas. Raccoon’s are omnivores, they will eat from garbage cans, dumpsters and will often steal pet food. Dog or cat food left outside is an open invitation to a raccoon, as raccoon’s have no fear of dogs, cats or even, humans. Sometimes, raccoon’s will even be clever enough to figure out a way to get to your pets food even if it is located inside the home. Raccoon’s are primarily nocturnal, so most of their mischief happens during the night. Raccoons are common throughout North America, however, they are very common in urban areas and less common in most rural areas. They can live up to 12 years in the wild. The raccoon’s located in the northern part of the U.S. tend to grow fairly large and have been known to reach over 50 pounds. Raccoon’s are easily recognizable by their well-known ringed tail and masked face. They are very strong for their size and are excellent climbers. Raccoon’s will do what they need to in order to survive. This means they can cause property damage by trying to break into basements, garages, roofs, screen doors or pet doors. Once they gain access to your home, they can continue to cause damage by ripping duct work, insulation or wires. They also pose a health threat because they can spread rabies or raccoon roundworm, which are both transferable to humans and your pets. Do not attempt to remove a raccoon from your attic or basement on your own. Contact A1 Exterminators at (800) 525-4825 to have a trained and licensed professional remove the animal.